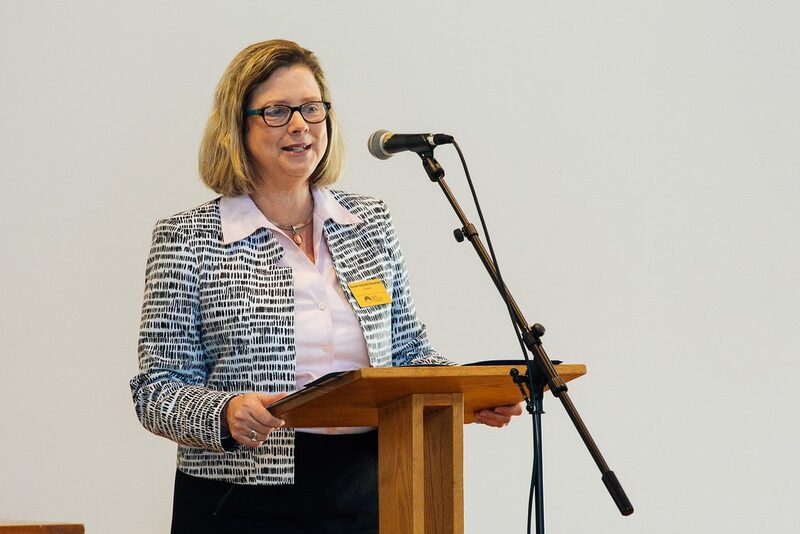 In March 2017, Huxman was inaugurated as EMU’s first female president — thus, a fitting representative to welcome more than 240 scholars, historians and participants from 19 states and 10 countries to a conference highlighting Anabaptist women who have not just encountered borders and barriers, but crossed them as well. Click here for conference coverage. I am delighted to welcome you to Eastern Mennonite University, a vibrant “Christian university like no other.” We are committed in word and deed to a noble mission: “to prepare our nearly 2,000 students to serve and lead in a global context in the spirit of the Scriptures: to do justice, love mercy and walk humbly with God.” That mission is palpable every day inside and outside the classroom, and at our other instructional sites — in Washington D.C. and Lancaster, Pennsylvania, and around the world in our extensive cross-cultural engagement semester required of all students. You arrive on our campus as we are poised to celebrate our centennial! In 1917, as America was entering the Great War, Mennonites in Virginia hatched a plan to open “a Mennonite school in the East.” Yes, I know Virginia is in the South, and EMU is located in the western part of the state, but EMU is east of Eden … I mean Goshen … and that’s what mattered to some Mennonites in 1917. What an amazing trajectory we’ve been on from our humble Bible and agricultural school roots. I am delighted to welcome you to Harrisonburg — a city of about 58,000 — with three universities. Harrisonburg is known as “the Friendly City.” I hope you find this to be true. As importantly, Harrisonburg is a diverse city — a dozen major languages are spoken here. Some of you may be familiar with the sign: “Wherever you are from, we are glad you are our neighbor.” That sign was created as a response to the chilly immigration climate that began up the road in our nation’s capital. That sign was started right here in Harrisonburg at Immanuel Mennonite Church. I am delighted to welcome you to the Shenandoah Valley. We are nestled in and around three mountain ranges: the Blue Ridge, the Alleghenies and the Appalachians — stunning vistas in every direction. And, finally, I am delighted to welcome you to the “Crossing the Line” conference. We are all looking forward to your spirited conversations, cutting-edge research, and inspirational creative activity — taken together — all bent on exploring the intersectionality of feminism and Anabaptism; gendered identities and faith identities. Contemporary and ordinary examples of women “crossing boundaries” continue to abound. Just this month, I was visiting with two women leaders. We were comparing stories about being our institution’s first woman president. Inevitably, the conversation turned to stories of how we navigate “the dance” between our feminism and femininity, our sense of command and compassion — and even the challenges of what to wear with which groups! And then there is the whole subtopic of shoes! Here’s the first story. This one is from Switzerland in the 1600s, and it features an Anabaptist woman named Margaret Hellwart. My colleagues at Conrad Grebel University College in Waterloo, Ontario — Arnold Snyder and Linda Hecht Huber (Linda is here at the conference) — neatly retell Margaret’s story in their book, Profiles of Anabaptist Women. Margaret Hellwart was an unusual, persecuted Anabaptist hero. Her story begins in 1608 in Beutelsbach, Switzerland. 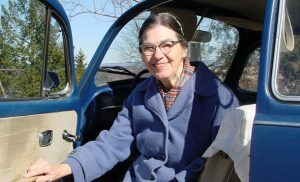 She was one of several energetic, recently converted Anabaptist women. Her husband was not. When state authorities discovered her proselytizing, they devised a method that they were sure would stop her ministry: They chained Margaret to her home. Thus, the reasoning went, she could prepare food and look after her children, but could not leave the house. Believe it or not, this chaining was carried out no fewer than 21 times over the course of 11 years between 1610 and 1621. Margaret, you see, was the original escape artist. Because no sooner had the chains been put on her ankle and fastened to the floor, she was free again. The authorities suspected that her husband or a sympathetic neighbor woman helped her. She disregarded the order to receive no visitors to her home. She continued to win female converts to the Anabaptist movement, sneaking out when she was less likely to be spotted. Surprisingly, Margaret did not leave for Moravia to escape the constant harassment, like most of the other Anabaptists in the area did during this time. She stayed, not to renounce her faith but to face down her persecutors, cheerfully, with a smile on her face, the records indicate, year after year after year. After 1621, the records on Margaret Hellwart fall silent. She was then 53 and by the standards of the time, old. There seems no doubt she got her wish to die as an Anabaptist. This second story is about a remarkable Anabaptist woman right here at EMU. Since you will be spending some time at this conference in an art gallery named for her and since you will be spending time in and out of many buildings on this campus that Margaret helped finance or gifted us, I thought you might be interested in the ways this Margaret has and continues to cross all kinds of barriers — with great speed! Margaret grew up in a very conservative Mennonite home. From early on, she loved her faith and she loved to run! She wore out so many girls’ shoes — they were flimsy “slippers,” she said, so finally her dad bought her boys’ shoes — high tops. She loved them — she could run faster! But she made them more feminine-looking by cutting them down to look more graceful. And she kept running. In 1944, plain dress, stockings, covering and all, Margaret was hired as the Eastern Mennonite School physical education teacher for boys and girls. She introduced tennis, volleyball, ping pong, basketball, tumbling and a game called speed ball — a hybrid soccer and basketball game. Margaret modeled these athletic activities with speed, finesse and fierce competitiveness to the delight and shock of her many students over the years. In 1962, Margaret left for Vanderbilt University to earn her doctorate in physical education. She was the only woman in the class and, as she said, “I must have looked a sight to these mostly Southern gentlemen — who at that time relaxed by smoking and drinking while I — the most wicked thing I did was drink milk from a straw.” While at Vanderbilt, she also earned a minor in art — with a specialty in water colors. And so she taught art here at EMU too. Modeling the most frugal of lifestyles, Margaret developed another superb skill set: wealth management and generous philanthropy to EMU. In 2005, Margaret was honored with the Philanthropist of the Year award for her “full court” investment in EMU: giving generously to the University fund, multiple capital campaigns and student scholarships. In an era when there were still questions about women and exertion, and perspiration, and varsity level competition, and whether women and men should play sports together, Margaret “Speedy” Martin Gehman did it her way. She “crossed the line” to live her faith, her passion for athletics and art, and her extraordinary first-fruits-giving to EMU’s mission and people. I hope you take sustenance from the tale of these two Margarets! I hope you enjoy learning from each other this weekend. I hope you find “shalom” in the Shenandoah. Very nice opening welcome to the Valley. I enjoyed reading.